I discussed on several occasions before the worsening of income distribution and the squeeze of the labor share in total income. Figure below provides updated information. Professor Autor and some of his co-authors suggest this in part might result from the rise of the 'superstar firm.' 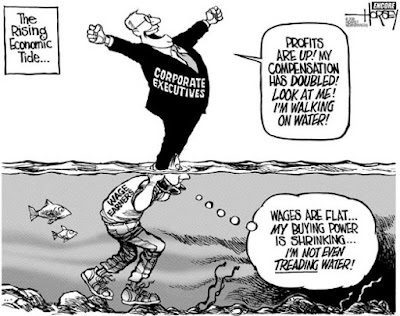 In other words, Facebook, Google (Alphabet), Amazon, Apple, etc and the winner take all economy. This paper (h/t Santiago Capraro) argues that this results from market power reflected in higher mark ups. Note that the paper by Autor et. al. suggests that superstar firms are more efficient and as their share of the market increase, their higher productivity and reduced labor force leads to a lower share for labor in the aggregate. It is mostly a technological effect for them. I have my doubts, of course, about any story that leaves out the relative bargaining power of the labor force, and in this story the regulatory environment that has allowed the information age firms to have such large shares of the market. But that's another story. 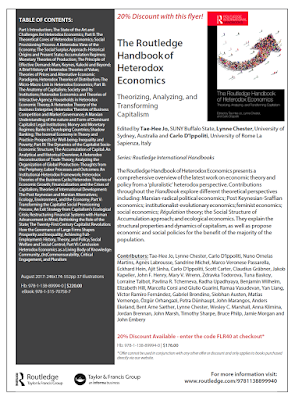 throughout the Handbook explore different theoretical perspectives including: Marxian-radical political economics; Post Keynesian-Sraffian economics; institutionalist-evolutionary economics; feminist economics; social economics; Régulation theory; the Social Structure of Accumulation approach; and ecological economics. They explain the structural properties and dynamics of capitalism, as well as propose economic and social policies for the benefit of the majority of the population. You can buy it here. Nicola Acocella published a paper in the Journal of Economic Surveys (a free, preliminary version is available here) on the development of the theory of economic policy. Acocella is clearly fully aware of the differences between classical political economics and marginalism (neoclassical economics). * And he dismisses the pre-margnialist views on economic policy as being unsystematic and devoid of general principles. Most classical writers and the marginalists had suggested cases where public intervention was in order. This had been so for Smith (1776), Ricardo (1817), Mill (1848), Marshall (1890), Walras (1874-1877, 1898). But these cases were mainly what Walras called ‘examples of empirical policy’ rather than consistent policy. They were certainly dictated on the basis of an analytical evaluation of the circumstances suggesting them, but were not part of a systematic and consistent assessment of the foundations and the articulation of public policy. In his view, economic policy as an autonomous discipline, meaning one based on theoretical principles, only started with Sidgwick, Marshall and Pigou, that is, with Welfare Economics or Social Choice Theory, which apparently now is referred to as Implementation Theory (I didn't know that, I might confess). So it is in the debate of the 1930s, with Robbins and his followers and critics, and more fundamentally with Arrow's Impossibility Theorem that he sees the development of the main themes of a theory of economic policy. He also suggests that before the development of a the theory of economic policy proper "the ‘night-watchman’ position became an exception as most classical and marginalist economists tended to state a number of specific or general cases where government intervention was in order." I'm not fully convinced about that. Sure there were some views about government intervention, but for the most part the Victorian consensus, among economists (not necessarily in practice, meaning actual economic policy) was for free trade, adherence to the rules of the Gold Standard, and sound finance. The idea of the minimal state was probably dominant, and the exceptions, particularly among marginalists that dominated in the UK at least, were associated to market failures. The two major obstacles to this dominant view that government action was possible, in Acoccela's view were due to Arrow and Lucas. In his words, these 'vital failures' were: "the impossibility of taking people’s preferences as a reference for public action, underlined by Arrow (1951) and ‘radical’ objections to effectiveness of public action of the kind raised by Lucas (1976)." I should note that it seems that, in his view, the major critiques have been successfully dealt with, by Sen and his followers in one field and New Keynesians in the other, and the current consensus would be that government action is possible and desirable. In this view, then, the history of the development of of the field is one in which the profession goes from being in favor of government action up to the development of the theory (essentially the from the beginning of marginalism to the 40s), broadly speaking, to being critical from the 50s to the 80s, with a slow return to a more interventionist consensus ever since. And maybe this describes well the field of Implementation Theory. But it strikes me as being at odds with conventional views of what the profession thinks about the role of government over time. I mean, normally you would think of the profession as being essentially for laissez-faire, the reason why sometimes there is a conflation of classical and marginalist authors, and then after the Great Depression and the Keynesian Revolution (even if not complete, and dominated by an imperfectionist view) there would be an interventionist turn, which starts to be contested in the 1970s, with the Conservative Revolution and the Great Inflation. The apotheosis of the return of the market would come with the fall of the Soviet Union, shock therapy and the so-called Washington Consensus. The question would be to what extent this neoliberal dominance has been undermined by the last Global Financial Crisis (I would say less than what people think). I also think that the dismissal of the classical political economy approach to economic policy, which was based on historical understanding of the specific conditions of a particular situation, is a mistake, and that there is a lot be learned from that tradition. Note that for classical political economy authors history and institutions, and, hence, policy analysis, were at a different level of abstraction, and had a different relation with the core of the theory (value and distribution). At any rate, this is an interesting paper worth reading. * For example, he is careful to note that the meaning of the invisible hand in Adam Smith is often out of context. However, he argues that: "we use the term ‘invisible hand’ as a metaphor of the Smithian position as well as of later theories, in particular neo-classical thinking, which has then prevailed, even if the latter are deprived of some social aspects of the working of the market that certainly were in Adam Smith." This reading of Smith leaves room for intervention in the case of imperfections, and seems to follow the ideas of Acoccela's mentor, the famous Italian economist Federico Caffè. At any rate, it's not surprise that Trump didn't condemn his base (and yes the racist voted for him; but as I noticed before 1964 those votes went mostly to Democrats). He certainly is more explicit than previous Republicans going beyond racist dog whistle politics. I would insist that racism is not the main reason why he won the election, and that a left wing populist right have won. The topic is still relevant (even in the middle of the violence and crazy confrontation with North Korea; btw, this is a must read for those interested on the history of US-Korea relations), since the lessons of the defeat are important to preclude 8 years of this madness. So this piece in the NYTimes shows that Obama-Trump voters, meaning voted for Obama in 2012 and for Trump in 2016, are real. ... the national vote doesn’t count, and Mrs. Clinton is not the president. She lost primarily because of the narrow but deep swing among white working-class voters who were overrepresented in decisive battleground states. ... racial resentment is the strongest predictor of the Obama-Trump vote in this survey data. White, working-class Obama voters with racially conservative views were very likely to flip to the Republicans. Note that not all the 'rednecks' in the Rust Belt are racists though. There is an interesting piece on the redneck revolt here. * It's also the home of the Virginia School, or the Public Choice School of Buchanan (briefly discussed here), that has been the subject of a new book that generated some controversy in economics circles. I'll have more to say about the book later, once I'm done reading it. In his book, Estudios de Historia Económica Argentina, Eduardo Basualdo has several tables with the data for the share of wages in income. Sources seem to be different and not necessarily compatible (although I 'm not sure about that). He also published a paper in 2008 with additional data. The graph below adds the numbers shown here, which I think are also from Basualdo (the newspaper only cites CIFRA; I couldn't find another source in their website). To the extent that one can trust numbers on functional income distribution, these numbers give a reasonable picture of what happened in Argentina since the first Peronist government back in 1946. 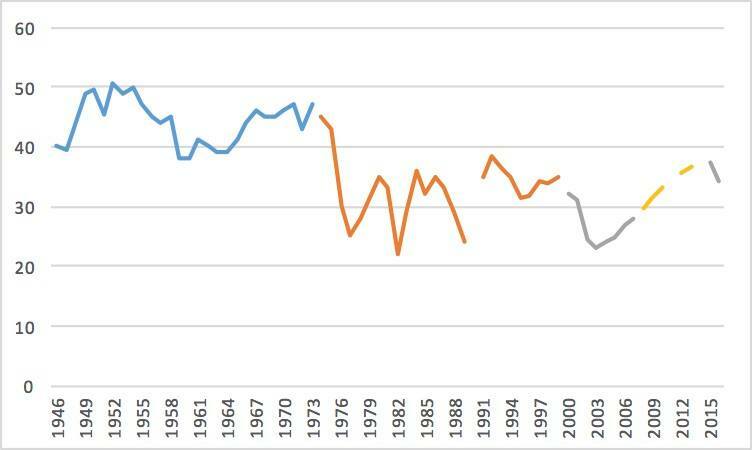 It is clear that the military coup in 1976 was implemented to reduce the share of wages. The graph also puts in perspective the last progressive administration of the Kirchners, which brought wages up from very low levels, but not quite to the pre-1976 level. I would expect the decline with Macri, that seems to have started (as I predicted), will go considerably further. 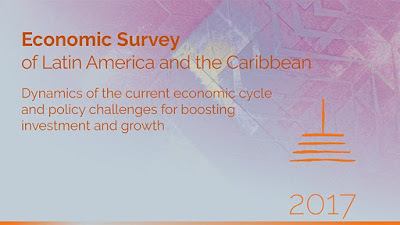 The Economic Commission for Latin America and the Caribbean´s (ECLAC) Economic Survey of Latin America and the Caribbean (“Dynamics of the current economic cycle and policy challenges for boosting investment and growth”) for 2016-2017 was published last Thursday (3 of August). 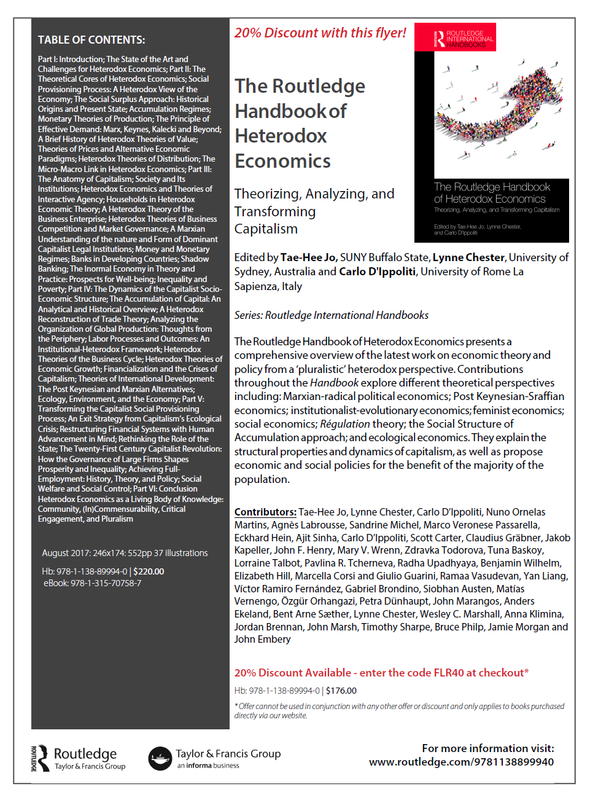 It incorporates a number of heterodox concepts and ideas mainly in Part II. These include the notion of center and periphery (which provides the framework for Chapter III “The region’s current economic cycle and its various characteristics are partly a reflection of changes that have occurred in the international economy and in the way forces are transmitted from the more advanced to the developing economies.” p.117 ); the importance of the productive structure (Chapters III and IV) to analyze the impact of the impulses from the center to the periphery; aggregate demand as a key driver of the world slowdown in trade (pp. 123-124); the relative importance of income versus substitution effects (pp.147-149); the investment multiplier (“There is ample evidence that points to the importance of protecting public investment …it represents a significant boost to economic growth in the medium term. …the cumulative effects of public spending variations on the output of 16 Latin American countries, with results showing that the cumulative multiplier of investment spending is significantly higher than that of consumption” p. 158); and the concept of total monetary demand (pp.163-166). 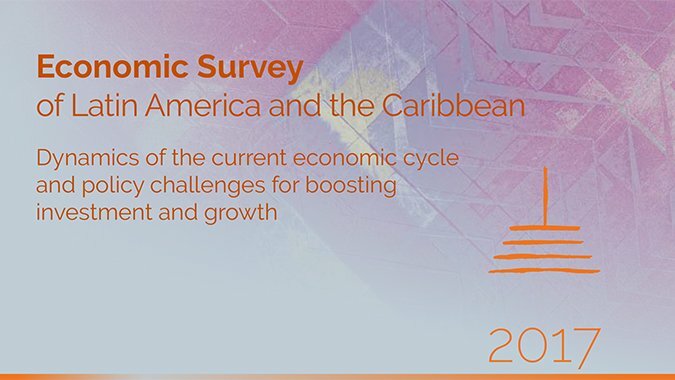 As such the report represents a significant attempt to return to ECLAC´s Structuralist roots while at the same including some of the main ideas of other heterodox schools of thought (i.e., post-Keynesian). This paper explains the “positive profits with negative surplus-value” example of Steedman (1975) and shows that while in joint production systems individual labour values can be negative, the claim that the total labour embodied in the surplus product of the economy (surplus-value) can also be negative is based on assumptions that have no economic meaning (such as negative activity levels). The paper also provides a way to measure the surplus-value of joint production systems which overcomes the problems of the traditional concept and restates the proposition that a positive amount of surplus labour is a necessary condition for positive profits. Read full paper here. A preliminary version was briefly noted here in 2012. Academic publications are slow indeed. Full show here. I'm interviewed at around 1:03 into the show, and the whole thing is about a bit less than 20 minutes long. The central question this paper addresses is the same one I explored in my joint work with Amit Bhaduri 25 years ago: under what circumstances are high wages good for employment? I extend our 1990 argument in three directions. First, instead of mark-up pricing, I model labor and product markets separately. The labor supply to the capitalist sector of the economy is assumed à la Lewis to be unlimited. Consequently the wage cannot be determined endogenously but is fixed by an extended notion of subsistence based on Smith, Ricardo, and Marx. For tractability the product market is assumed to be perfectly competitive. The second innovation is to show how disequilibrium adjustment resolves the overdetermination inherent in the model. There are three equations – aggregate demand, goods supply, and labor supply – but two unknowns – the labor–capital ratio and the real price (the inverse of the real wage). Consequently equilibrium does not even exist until we define the adjustment process. The third innovation is to distinguish capital deepening from capital widening. This is important because, ceteris paribus, wage-led growth is more likely to stimulate the economy the greater the fraction of investment devoted to capital deepening. A final section of the paper shows that US data on employment and inflation since the 1950s are consistent with the theory developed in this paper. Marglin's paper is open, and so is Bhaduri's. Full issue here.